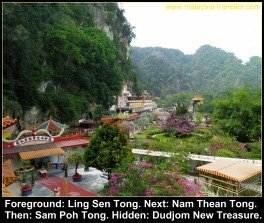 Ling Sen Tong cave temple is located next door to Nam Thean Tong and Sam Poh Tong just off Jalan Gopeng on the southern outskirts of Ipoh. Ling Sen Tong probably picks up a lot of tourist visitors who are heading to those more famous cave temples. This temple is quite different from its neighbours. The garden in front is decorated with colourful statues of characters from Chinese mythology such as the Monkey King from the classic tale Journey to the West. This is a common theme among Chinese temples in Malaysia and I have seen similar ones at Broga and at Chin Swee Temple at Genting Highlands. The almost cartoon-like caricatures of dragons, the Goddess Kuan Yin and other figures give the temple a children's theme park atmosphere and I am sure this place must be a hit with kids. The cave itself is very shallow (unless there is a hidden part which I did not find) and is more like an overhang of the hill Gunung Rapat which looms above the temple. Although the courtyard outside may resemble a children's garden, the cave temple itself appears to attract serious devotees judging by the roof of the cave which has been stained black by the smoke of countless joss-sticks. Further up the street I noticed a newish looking building with Tibetan style features, Dudjom New Treasure Buddhist Society. 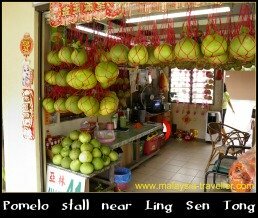 In front of the temple is a row of shops selling pomelos for which Ipoh is famous. There is fierce competition among the vendors and some of the shops have recruited young attractive women in order to lure customers. I went to a stall with a middle aged shopkeeper thinking that I was less likely to get overcharged. I was wrong - I still had to pay foreigner prices. She wanted RM13 for a small sized pomelo and RM38 for a football-sized one. I bought a small one. It was juicy but too sweet for my taste. 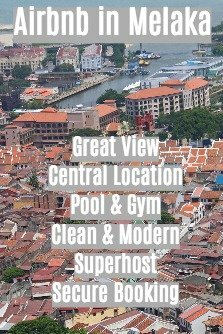 Sorry Ipoh, I prefer the sharper Thai variety! I have marked this temple on the interactive map on the main Caving page. From central Ipoh head south on Jalan Gopeng (Federal Route 1) towards Simpang Pulai. 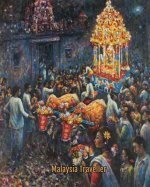 You will see the colourfully decorated temples on your left at the foot of a hill (Gunung Rapat). Access to the cave temples is via a slip road directly behind the Pomelo Stalls opposite Hillcity Hotel.